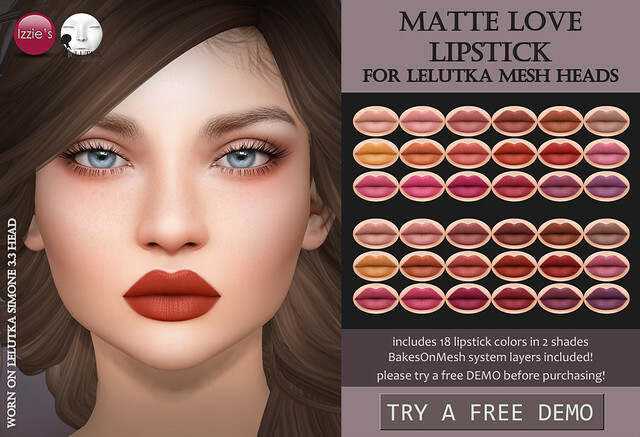 Izzie’s released Perfect Liner sets for LeLutka and LAQ mesh heads at the mainstore for Fifty Linden Fridays! The Perfect Liner appliers were made for all 10 current female LeLutka Bento mesh heads and 22 current female LAQ Bento mesh heads (date: February 28th 2019) and they may also work for future LeLutka/LAQ heads. 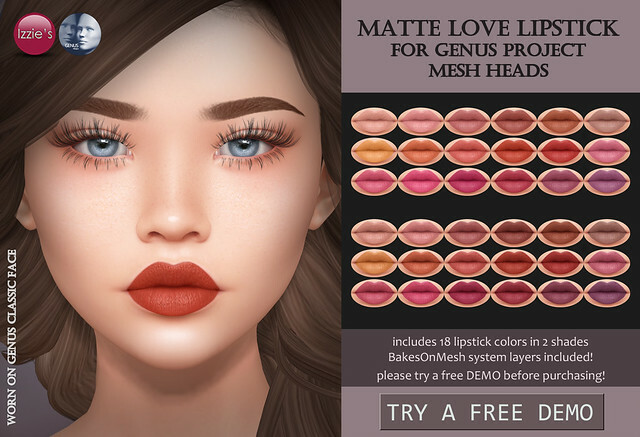 As you may know, mesh heads are all different, even among mesh head brands, so not all makeup made for a mesh head brand will look good on all of their heads. 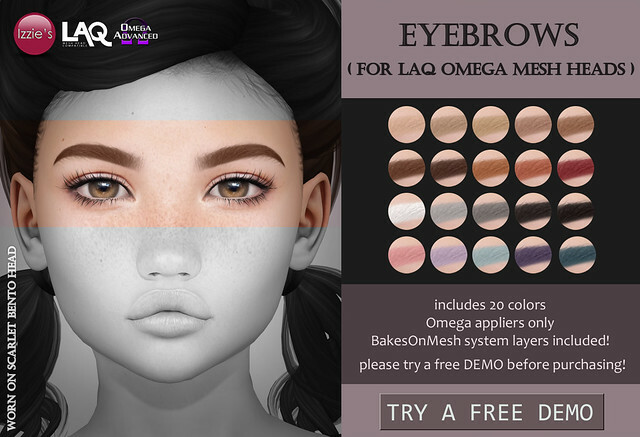 That’s why I have created this set of eyeliners that will work for every single female Bento mesh head that is currently available at the LeLutka/LAQ store. The liners have been tested using the shapes and skins included with the LeLutka/LAQ heads. Depending on the shape and skin you are wearing the liners will look different than intended. So please try a free DEMO before purchasing to make sure they work for you! Izzie’s released Eyelid Changer Monolid appliers and Freckles & Heart Mole appliers for LAQ/Omega mesh heads at Izzie’s mainstore for Fifty Linden Fridays. The monolid Eyelid Changer includes 15 shades for light – dark skintones and comes with natural eyelid version, with eyeliner version and with eye make-up version. 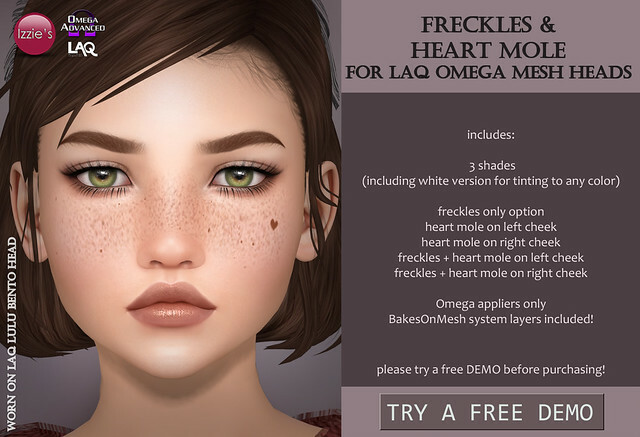 The Freckles & Heart Mole set includes a freckles only option, heart moles on left or right cheek (without freckles) and a freckles and left or right mole combined. 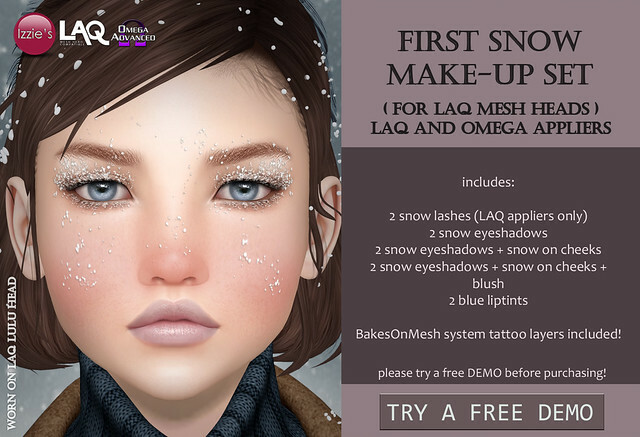 Omega appliers as well as BakesOnMesh system tattoo layers are included. To make sure they will work for you please try a free DEMO before purchasing! 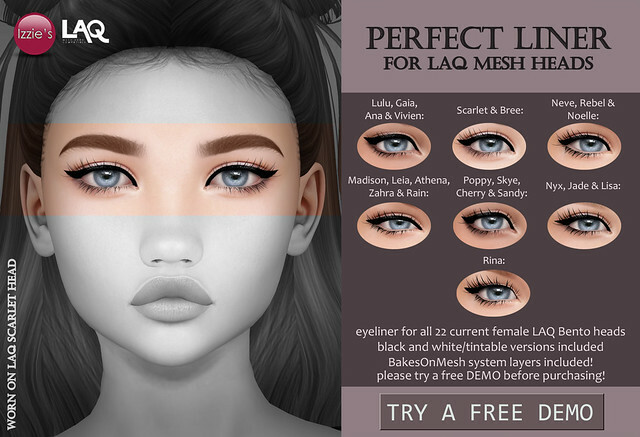 Izzie’s LAQ Lashes Appliers have been updated for LAQ 3.0 (and higher) Bento mesh heads! 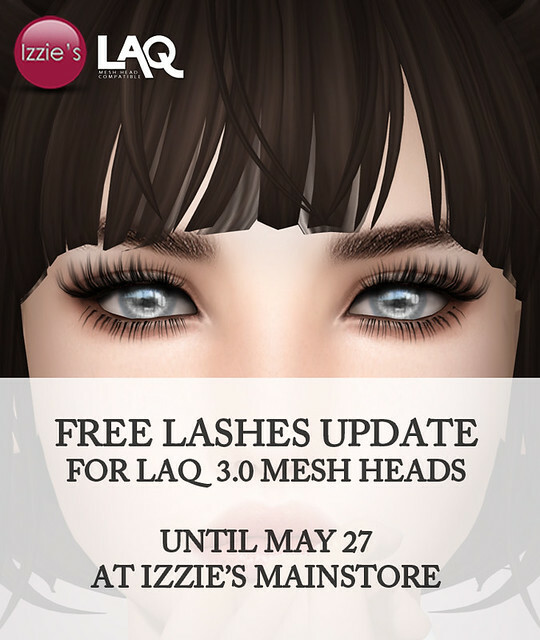 Grab the free update at Izzie’s mainstore (new releases area) it will be available for free until May 27th.